These are the people one should follow on twitter to stay up to date Sebastian Daschner, Matt Raible, Julien Dubois, Pieter Humphrey, Monica Beckwith, Thorsten Heller, Vladimir Pavlov, Rustam Mehmandarov, Cameron McKenzie, Michael P. Redlich, Gabriela Motroc, Dmitry Alexandrov, Nicolai Parlog, Bozhidar Bozhanov, Nicolas Frankel, Michael Simons, Simon Ritter, Markus Eisele, Rafael Winterhalter, Yolande Poirier, Josh Long, Brian Goetz, Joshua Bloch, Simon Maple, Stephen Chin, Stephen Colebourne, Stephan, Mark Reinhold, Antonio Goncalves, Trisha Gee, Mario Fusco, Adam Bien, JavaFXpert, Lukas Eder, Eugen (Baeldung), Vlad Mihalcea, Martin Fowler, javinpaul, Roberto Cortez, Thorben Janssen, Reza Rahman, Arun Gupta, Bruno Borges, David Delabassée. These are the medias to follow InfoQ, DZone, TheServerSide.com, JAXenter.com, Java Code Geeks, InfoWorld, SpringCentral, IBM developerWorks, JavaWorld, jOOQ, OverOps. Special thanks to Baeldung’s list of best Java blogs. – Google search “Java” and filter for news in the last 24 hours. – Go to Twitter and search your feed if you follow the above or search for #Java and see the top choices from the last 24 hours or go through all. – Go to the personal blogs or the media above and check the content from the last 24 hours. – Go to Medium and type in the search Java. Then select the Java tag and press latest stories. 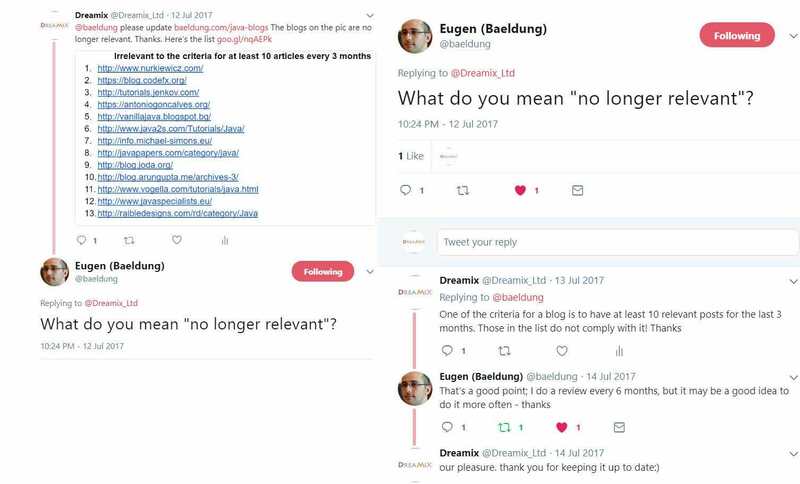 It’s hard to keep up and support a good Java blog. Many died during 2017 or started posting very irregularly. Examples Voxxed, Mkyong, JavaSpecialists, Raible Designs, Java Papers, Stephen Colebourne’s blog, Miles to go, Plumbr, Vanilla #Java, HowToDoInJava. It’s a huge community compared to other tech ones but it’s a small one compared to cat lovers or sport cars’ fans. There aren’t so many news on Java on a daily basis. There are many blogs in the form of tutorials – mainly on the basics. 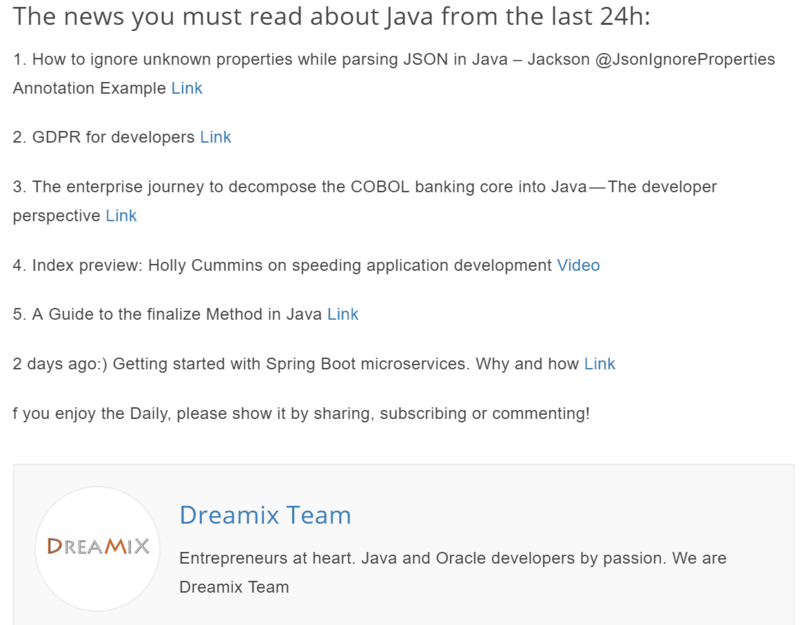 The way I publish the Java Daily is bad for Dreamix blog SEO. It’s because there are many links and not so much text/content. However, I started using “no-follow” links so our website could still be visible and Java Daily could be enjoyed by the Java community. It’s the way to get to know the Java world and it’s the way to get noticed. It’s super hard to get readers. Twitter is the best way to communicate with the community. To build a readers’ list and increase the number of readers to 1000 by the end of the year. To motivate more Java experts to share and write content and thus contribute to the community. To turn the Java Daily into a beautifully crafted newsletter. In conclusion, it’s really invigorating when you look back and persevere. Posting the Java Daily more than 250 times in 2017 is somehow an achievement, I know that for sure the results, especially for the number of readers could be better but still, getting to know the Java community is a huge reward for me. Looking forward to 2018 and the goals I have. You can subscribe to the Daily here. Wish you an amazing new year and remember sometimes it’s more important how much effort you put and the results will come. Java Programming is nice topic to share.